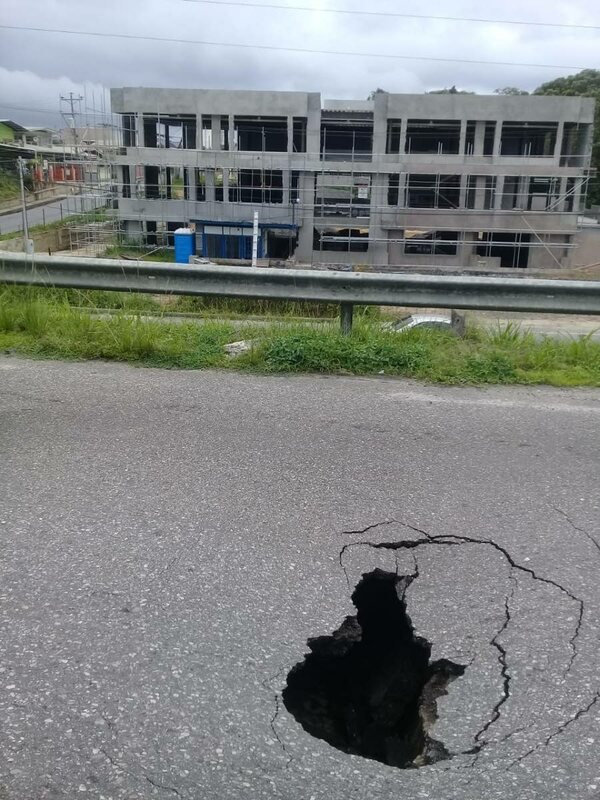 DANGER: The sinkhole which opened up yesterday along the southbound lane of the Solomon Hochoy Highway after the Freeport flyover. A SINKHOLE opened up yesterday on the southbound lane of the Sir Solomon Hochoy Highway just after the Freeport flyover. Newsday understands the sinkhole was first spotted on the left lane of the highway, close to the Freeport tunnel shortly after 3 pm when a truck went into it, bursting a tyre. Police cordoned off the road and redirected traffic onto the Unicomer access road that runs parallel to the highway. Works Minister Rohan Sinanan said he was informed of the sinkhole by Director of Highways Navin Ramsingh shortly after it happened. He said in cases like this, Ramsingh would visit the site, assess it and give instructions for emergency repairs to be done immediately. When Newsday contacted him around 3.40 pm, he said Ramsingh was close to the site for the assessment. Around 5.15pm, Sinanan said the cause of the sinkhole had been determined as a failed cylinder. He said minor repairs would be done overnight and the sinkhole repaired over the weekend. The incident caused traffic to pile up on both sides of the highway as curious drivers on the northbound lane slowed down for a better look at the sinkhole and those on the southbound were restricted from driving over that segment of road. On July 24, a small sinkhole opened up on the westbound lane of the Beetham Highway near NP was and was repaired in a matter of hours, with permanent repairs done after several days. In February 2017 a sinkhole on the Beetham Highway near Sea Lots also caused traffic to pile up for miles. A SINKHOLE has opened up on the southbound lane of the Sir Solomon Hochoy Highway, just after the Freeport flyover. Newsday understands the sinkhole was first spotted shortly after 3pm today. Police have cordoned the road and are redirecting traffic on the Unicomer access road that runs parallel to the highway. Works Minister Rohan Sinanan said he was informed of the sinkhole by the Director of Highways Navin Ramsingh shortly after it appeared. He said in cases like this, Ramsingh would visit the site, assess it and give instructions for emergency repairs to be done immediately. Reply to "Overnight repairs for sinkhole "